The Kazakhstan media delegation visited Wuhan, capital of central China’s Hubei Province, from April 12-14, 2019. 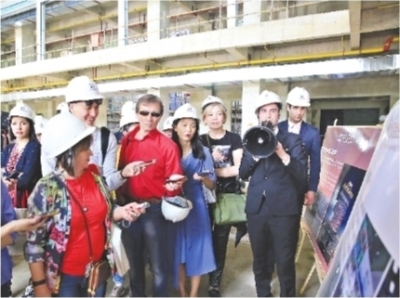 Co-organized by the Embassy of the People’s Republic of China in Kazakhstan and the Foreign Affairs (Overseas Chinese Affairs) Office of Hubei Provincial People’s Government, the delegation consisted of 18 journalists from 14 mainstream media in Kazakhstan. On April 12, the delegation came to Wuhan New Port Central China Trade Service Area. Wuhan New Port has been an international shipping financial harbour connecting the “Belt and Road” and the Yangtze River Economic Belt, so as to provide one-stop services for modern finance and contribute to the cooperation between China and Kazakhstan, according to an official the Yangtze River International Shipping Financial Harbour. On April 13, the delegation visited the wholesale exhibition center in Wuhan Asia-Europe Logistics Co., Ltd, where they enjoyed vodka and chocolate from Kazakhstan. They also watched Chinese Kungfu performances and tasted Chinese tea. “I visit Wuhan for the first time, and I am very impressed with the rapid development of Wuhan. I hope that more quality products from Kazakhstan will be shipped to Wuhan through China-Europe (Wuhan) freight trains. I am looking forward to having an interview in Wuhan during the 7th CISM Military World Games in October this year,” said a Kazakhstan journalist Samedova Ainur.